For eleven years PVF has sponsored the Parent Involvement Workers in East Palo Alto wherein we hire immigrant women who have graduated from ESL class to work in public schools in East Palo Alto. Their job is to get parents – especially non-English speaking parents – involved in the education of their children. 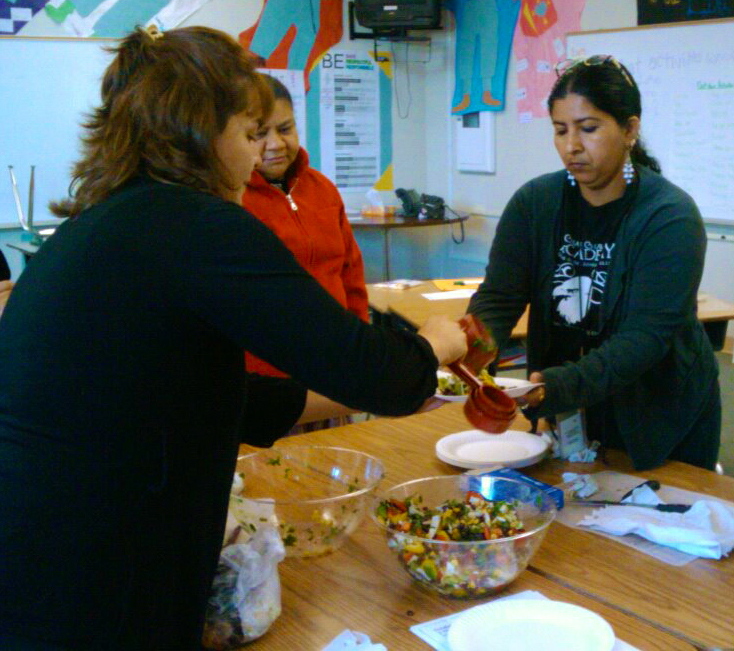 These women have become an integral part of Cesar Chavez Middle School, and the teachers and principal love them. On their own the three workers designed a Nutrition Program for parents, where a nutritionist from the local family health center comes to conduct a class on better health through nutrition. Many of the family members of students suffer from diabetes, high blood pressure, high cholesterol. On November 7th I visited the nutrition class on Eating Well. The Parent Involvement Workers called 60 parents and 15 showed up for a two hour class, mostly mothers with infants in arms and an eagerness to learn. They learned about salt, fat and sugar in food. They prepared fresh vegetables, and they cooked a healthy meal of lentil soup. 15 parents attending is considered a good turnout, but it only happened because of a personal phone call from one of our workers, who have built relationships with the parents. PVF gave a grant of $400 which covers the costs of six nutrition classes. This is exceptional in terms of what a small amount of money can do. One PVF donor now gives a monthly $250 to the Principal of this school, to cover such costs and to allow for special projects. At PVF we are proud that we can find such critical intervention points where philanthropic money has a positive impact. This entry was posted in Uncategorized and tagged East Palo Alto, education, nutrition, Where's Bill. Bookmark the permalink.